Olive Oil, Distilled Water, organic and sustainable Palm Oil, Coconut Oil, Lye, Castor Seed Oil, Shea Butter, Goat Milk Powder. Why Goat Milk? Because it is creamy, moisturizing and oh so good for your skin! This one is really nice for those with sensitive skin or who prefer no scent. We all know someone who doesn't tolerate scent well. Or maybe they just have too many sensitivities to, well, everything. This is the soap for THAT guy! There have also been some studies showing this is a great soap for cancer patients who are getting radiation burns or chemo skin. 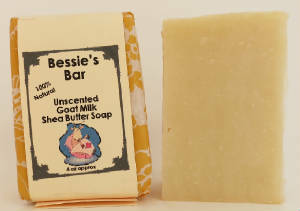 I call it a plain jane soap, but, in reality it is the Super Power of all soaps. Basic. Mild. Wonderful.